Earn $12.74 in VIP credit (1274 points)What's This? The EC90 SL Road Chainring/Spider Assembly is designed around the EC90 SL crankset, this versatile system utilizes RaceFace's Cinch technology, replacing the traditional crank spider and ensuing spider-mounted chainrings with direct mount 1x or 2x spiders. Pre-ride a cyclocross course and swap out for a larger or smaller spider on the fly to suit the course or the competition. Swap the 1x spider out for a 2x spider and make that same 'cross race bike a road riding machine. Developed with rigorous lab testing, Easton went through seven rounds of revision to ultimately land on this final product. Heavily machined for weight savings and superior stiffness, the EC90 SL chainrings deliver excellent shifting performance with the optimized shift ramps and pins. Utilizing the CINCH system, swapping out the direct-mount rings is as easy as loosening the drive side crank arm and sliding the spider off the crank spindle. 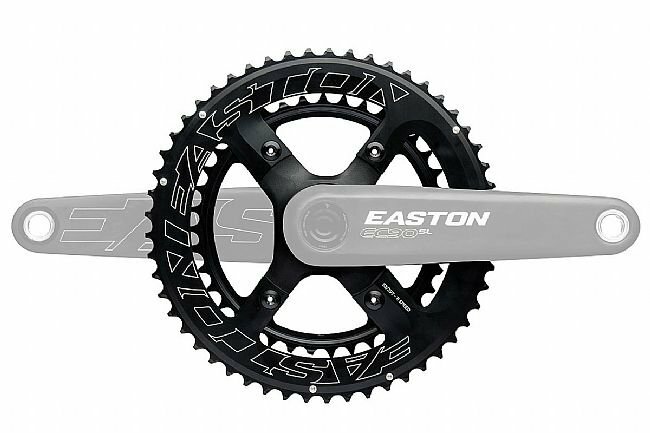 The Easton EC90 SL Road Chainring/Spider Assembly is available as a 53x39T (255g), 52x36T (243g), or 50x34T (227g) direct-mount spider.